Pure honey on tap year round. Your containers or ours! 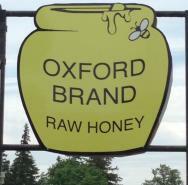 Un-pasteurized liquid honey or naturally creamed honey. Comb honey, pure beeswax candles, beeswax cosmetics, pollen & other bee specialties.